In this guide we are assuming that you're trying to fix permissions for the AU plugin, which is located under the Components folder; if you're fixing permissions for the VST plugin, instead, you have to look in the VST folder. where Your User Name is the user name you log in with. In the illustrated example that follows, we are trying to fix permissions for the file VB3.component which is located in /Library/Audio/Plug-Ins/Components under the system hard drive path. Right click (or CMD-Click) on it so to display the contextual menu, and choose Get Info. 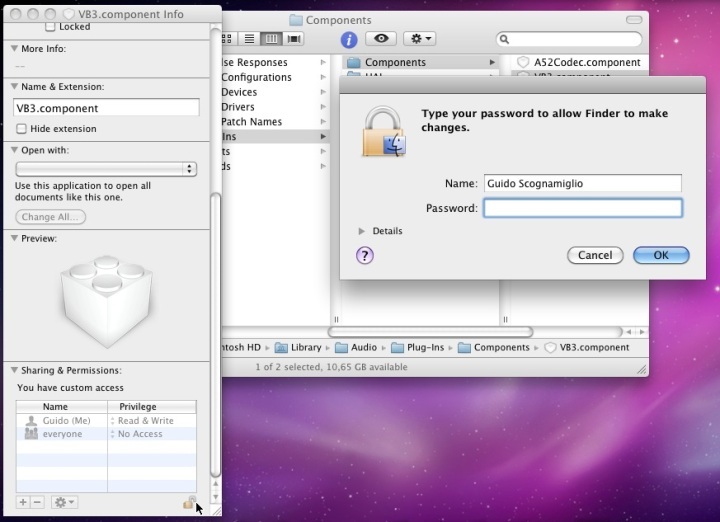 You can open the File Info window more quickly by selecting the file and pressing CMD-I on your computer keyboard. And here the File Info window appears, but it's reported as "Locked", means that you can't modify the permissions unless you unlock it by clicking that small lock in the bottom right corner and inserting your credentials when you're prompted to do so. You see there? The user everyone has no rights at all! That's the problem. 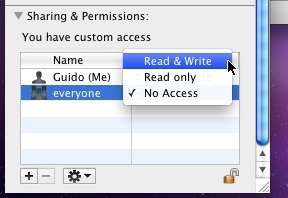 It should at least have read only permissions, but we give it both read & write priviledges so to be sure. PLEASE NOTE: if fixing permissions for the executable file still doesn't help, you might have to fix the permissions for the parent folder(s) too.